For 50 years The Who have been one of the most creative, dynamic, popular and constantly interesting bands to emerge from Britain during the 1960s. They were created from the unique chemistry of Pete Townshend's brilliant song writing and guitar playing, coupled with Roger Daltrey, THE archetypical rock vocalist and front man, along with the wild and crazy, but always fabulous, Keith Moon and the man they called The Ox, John Entwistle on bass. They are a band of countless dichotomies but one that defied the odds and survived. They are The greatest rock band in the world - rock in the original sense of the word. Pete Townshend and John Entwistle met at school in Shepherd's Bush, London. Townsend's father was a professional saxophonist playing with many dance bands and soon banjo playing Pete and trumpeter John were in a New Orleans style jazz band; Entwistle playing trumpet and Townshend playing banjo. They graduated to playing in a rock and roll band in the early 1960s before Entwistle left to join the Detours, whose guitar player was Roger Daltrey. By early 1963 Townshend had joined the Detours and Daltrey had become lead singer having stopped playing guitar. Playing American style R&B they also did rock and roll too as they developed their sound, one in which Pete played both the lead parts and the rhythm parts, very unusual for the time. With the Beatles grabbing the headlines the Detours decided their name was not cutting it and eventually decided on calling themselves, the Who. At around the same time they lost their drummer who had a wife and responsibilities - enter Keith Moon who had none. They secured a regular spot at The Marquee club in Soho, working part time during the day to survive, although Pete went to art school. They also acquired a manager, Peter Meaden who decided that the Who was a terrible name and decided they should be called The High Numbers (terrible name. Ed.). He also had them dress in suits and generally played up their R&B credentials - they were a Mod band. The Mod culture of scooter driving kids had really begun to take a hold and Meaden was anxious to have his band as THE Mod band. Meaden got a deal with Decca Records and The High Numbers released a song geared specifically to Mods, 'I'm The Face' written by Meaden failed to excite the Mods and as a result the band ditched Meaden and reverted to calling themselves, the Who. In the process they acquired new managers, Oxford educated, Kit Lambert and Chris Stamp. Around the same age as the band they were typical 60s hustlers, with a difference. Stamp was from the East End, the brother of the actor Terence Stamp and Lambert's mother was the composer Constant who could not have been more top drawer. The Who had a regular gig at the Railway Hotel in Wealdstone, northwest London which is where Lambert first saw them. He brought in Stamp, who was very keen that they changed their image, encouraging them to make use of the red, white and blue roundel that become their iconic logo. This was the time that the Who began using the tag, 'Maximum R&B' - it certainly was. At the end of 1964 with a great fan following things were coming together for the band and they secured a record deal through Shel Talmy, an American who was based in London. Townshend's 'I Can't Explain' became their first single and went to No.8 on the UK singles chart, followed a few months later by 'Anyway, Anyhow, Anywhere'. Their third single, before the year was out was the anthemic 'My Generation', which got to No.2 and became the title of their first album which went to No.5 on the chart shortly after Christmas. Keith Moon's destruction on stage of his drum kit and Pete Townshend's regular smashing of guitars meant that the band was attracting headlines, but it was all costing a lot of money. This tended to overshadow their musical ambitions at this point, which inevitably resulted in a shift from the wildness of the stage shows to a more considered approach to the music. The band's first hit for Polydor on its Track label was the fabulous 'Pictures of Lily', one of THE great singles of the decade. Even at this point the diversity in the band's singles was plain to see and their two album releases reinforced that notion. Their third album, The Who Sell Out, confirmed just how different they were as a band from their contemporaries. It is a concept album with a story line of a mock-pirate radio broadcast, and includes the magnificent song 'I Can See for Miles' - it's one of pop's great mysteries how this only managed to make No.10 on the singles chart. Likewise the album only made No.13, history has been more kind. During 1968 their two singles, 'Dogs' and 'Magic Bus' could not even crack the UK Top 20. As far as America was concerned, 'I Can See For Miles' made No.9 in the Billboard chart as 1967 was coming to an end. 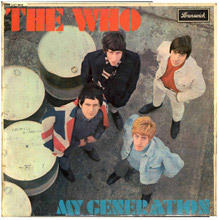 It was the biggest hit single the Who achieved in the USA - 'My Generation' had only made No. 74 and 'Happy Jack', the previous best performing song, had just failed to get into the Billboard Top 20. As with most bands, before the Pepper-shed, singles were what counted and while the Who had done fairly well with the My Generation and A Quick One albums in 1965 and 1966 respectively, The Who Sell Out, was certainly a disappointment. In America their only album, prior to 1969, to achieve any success was Magic Bus - The Who On Tour, which made No. 39 on the US album chart. Things were not looking good for the band, a band that had always had more than its fair share of inbuilt kinetic energy. There were some who thought they would probably not survive. Pete Townshend had other ideas, a very big idea. From writing a mini rock opera he decided to write a complete rock opera, and not just a single album, but a double album. The first the public knew of this magnum opus was in March 1969 when the Who released their new single, 'Pinball Wizard'. It was a return to the form of their very best singles and the rumours surrounding the album from it was taken suggested this was going to be a monster record. It was indeed. Tommy upon its release at the end of May 1969 satisfied critics and fans alike. Such was the scale of the recording, the endless overdubs and the studio time involved that it nearly bankrupted band and managers. Tommy made the American Top Ten as the group toured extensively to promote it, including shows at the London Coliseum and the Metropolitan Opera in New York as well as appearing at Woodstock in August 1969. 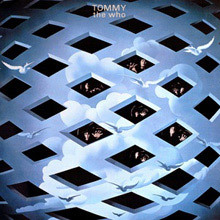 Prior to the film of the iconic festival coming out Tommy made No.2 in Britain and with the movie's release it pushed the Who's reputation still higher, helped by two years of almost non-stop touring. The story of the 'deaf, dumb and blind boy' was, for many, Pete Townshend's masterpiece as a writer and the Who's crowning glory as a band. At the time it was dubbed a 'rock opera' but as many have pointed out ever since it lacked the normal opera form. Whatever it is, it's a tour de force that was groundbreaking; rock has never been the same since. Off the back of touring the group released Live at Leeds in 1970, which included two minor hit singles, Summertime Blues' and 'The Seeker.' The question was, how to follow Tommy. Townshend's answer was another concept album, Lifehouse. It never got released, as the rest of the band didn't like it and Pete made himself ill over the recording of it. Once again the band were at a critical point. With Pete back to full fitness they set about recording, Who's Next with producer Glyn Johns. It is nothing like Tommy of course, it is a traditional album but it is also magnificent. There is not a bad track and to single just two out seems almost disrespectful, but 'Baba O'Riley' and the exultant, 'Won't Get Fooled Again' are just amazing; fans thought so too and it became their first, and so far only, No.1 album in the UK. Listen to the first track and you'll get why Keith Moon was just so damn good. It was an album that put them into the top tier of touring rock bands. Along with The Stones they created stadium rock. 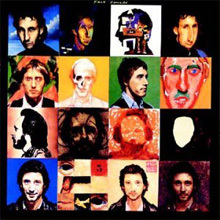 How to follow such an album was certainly a challenge and Townshend was up to it. 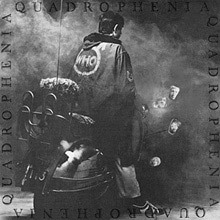 His homage to Mod culture, scooters and parkas, 1973's Quadrophenia is another truly outstanding album. Away from Britain the story did not resonate so it was not easy touring with the album. A scaled down Quadrophenia along with their most popular tracks from their career to date was the answer. From this point the Who spent some time concentrating on solo projects. Townshend very much took time out. Entwistle had his own band, Daltrey acted and Moon? Moon was just Moon. While there was comedy in all of Moon's manic activities there was tragedy looming. They did regroup to record The Who by Numbers in 1975. The following year Moon collapsed on-stage in Boston and while he thought it was all a bit of a joke, he was in far from great shape. Just as they released the Who Are You album in 1978 tragedy struck when Keith Moon died in his sleep after taking an overdose of a prescription drug designed to help him combat his alcohol addiction. Kenney Jones who had started out in the Small Faces - he was still with them when they grew up and became the Faces - joined the band and was an able, but far from inspiring, replacement. They continued with this line-up until 1983 when Townshend officially announced his departure from the Who. They began working on a new album in 1979 but before they released a new record, they put out the soundtrack to The Kids Are Alright to accompany a documentary of the band and contributed music to Franc Roddam's cinematic adaptation of Quadrophenia, which starred Phil Daniels. Following a tragedy at a concert in Cincinnati in late 1979 the band effectively fell apart. Townshend descended into booze and drugs and it wasn't until 1981 that they got back together to record Face Dances, their first album since Moon's death. A year later they released It's Hard, which includes the mighty 'Eminence Front', and began a farewell tour, out of which came the live album,Who's Last in 1984. Re-uniting to play Live Aid in 1985 the Who were back on the road in 1989 for a 25th anniversary tour with Simon Phillips on drums; Townshend's hearing problems reduced him to acoustic guitar and it was not the Who fans had come to cherish. However the tour did phenomenal business and included several performances of Tommy featuring guest stars including Billy Idol and Phil Collins. Through the 1990s various incarnations of the band took place, including one without Townshend, although Daltrey refused to call it the Who, opting for 'Daltrey Sings Townshend' instead. By 1999 the Who were back as a five-piece with Ringo Starr's son Zak Starkey on drums and John 'Rabbit' Bundrick on keyboards - this was more like the classic Who of old. Then in June 2002 the Who was about to begin a North American tour when Entwistle died in the Hard Rock Hotel in Las Vegas, he was 57 years old. In 2006, Townshend and Daltry released the mini-opera Wire & Glass, their first recording as the Who in 25 years. Endless Wire, which included the EP of Wire & Glass, was critically acclaimed - The Who was finally back on track. Since then the Who have carried on with Pete and Roger finding renewed creative and performing energy. The Who are timeless, just like their music, much of which sounds as fresh today as when it was first recorded, which is more than can be said of many of their contemporaries. Some "Maximum R&B" influence lingered in the two James Brown covers, but much of Townshend's original material fused Beatlesque hooks and power chords with anthemic mod lyrics, with "The Good's Gone," "Much Too Much," "La La La Lies," and especially "The Kids Are Alright" being highlights. "A Legal Matter" hinted at more ambitious lyrical concerns, and "The Ox" was instrumental mayhem that pushed the envelope of 1965 amplification with its guitar feedback and nonstop crashing drum rolls. While the execution was sometimes crude, and the songwriting not as sophisticated as it would shortly become, the Who never surpassed the pure energy level of this record. The Who's second album is a less impressive outing than their debut, primarily because, at the urging of their managers, all four members penned original material (though Pete Townshend wrote more than anyone else). The pure adrenaline of My Generation also subsided somewhat as the band began to grapple with more complex melodic and lyrical themes, especially on the erratic mini-opera "A Quick One While He's Away." Still, there's some great madness on Keith Moon's instrumental "Cobwebs and Strange," and Townshend delivered some solid mod pop with "Run Run Run" and "So Sad About Us." John Entwistle was also revealed to be a writer of considerable talent (and a morbid bent) on "Whiskey Man" and "Boris the Spider." 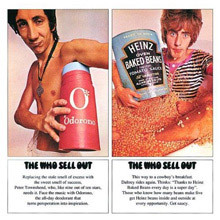 Pete Townshend originally planned The Who Sell Out as a concept album of sorts that would simultaneously mock and pay tribute to pirate radio stations, complete with fake jingles and commercials linking the tracks. For reasons that remain somewhat ill defined, the concept wasn't quite driven to completion, breaking down around the middle of side two (on the original vinyl configuration). Nonetheless, on strictly musical merits, it's a terrific set of songs that ultimately stands as one of the group's greatest achievements. "I Can See for Miles" (a Top Ten hit) is the Who at their most thunderous; tinges of psychedelia add a rush to "Armenia City in the Sky" and "Relax"; "I Can't Reach You" finds Townshend beginning to stretch himself into quasi-spiritual territory; and "Tattoo" and the acoustic "Sunrise" show introspective, vulnerable sides to the singer/songwriter that had previously been hidden. "Rael" was another mini-opera, with musical motifs that reappeared in Tommy. 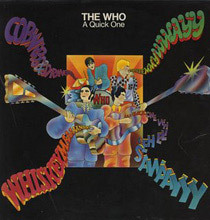 The album is as perfect a balance between melodic mod pop and powerful instrumentation as the Who (or any other group) would achieve; psychedelic pop was never as jubilant, not to say funny (the fake commercials and jingles interspersed between the songs are a hoot). "Someone's Coming," and an alternate version of "Mary Anne with the Shaky Hand." Much of Who's Next derives from Lifehouse, an ambitious sci-fi rock opera Pete Townshend abandoned after suffering a nervous breakdown, caused in part from working on the sequel to Tommy. There's no discernable theme behind these songs, yet this album is stronger than Tommy, falling just behind Who Sell Out as the finest record the Who ever cut. Townshend developed an infatuation with synthesizers during the recording of the album, and they're all over this album, adding texture where needed and amplifying the force, which is already at a fever pitch. Apart from Live at Leeds, the Who have never sounded as LOUD and unhinged as they do here, yet that's balanced by ballads, both lovely ("The Song Is Over") and scathing ("Behind Blue Eyes"). That's the key to Who's Next -- there's anger and sorrow, humor and regret, passion and tumult, all wrapped up in a blistering package where the rage is as affecting as the heartbreak. This is a retreat from the '60s, as Townshend declares the "Song Is Over," scorns the teenage wasteland, and bitterly declares that we "Won't Get Fooled Again." For all the sorrow and heartbreak that runs beneath the surface, this is an invigorating record, not just because Keith Moon runs rampant or because Roger Daltrey has never sung better or because John Entwistle spins out manic basslines that are as captivating as his "My Wife" is funny. This is invigorating because it has all of that, plus Townshend laying his soul bare in ways that are funny, painful, and utterly life-affirming. That is what the Who was about, not the rock operas, and that's why Who's Next is truer than Tommy or the abandoned Lifehouse. Those were art -- this, even with its pretensions, is rock & roll. 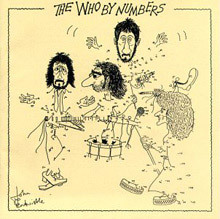 The Who by Numbers is the seventh album by English rock band The Who, released on 3 October 1975 in the United Kingdom through Polydor Records, and on 25 October 1975 in the United States by MCA Records. It was named the tenth-best album of the year in The Village Voice critics poll. 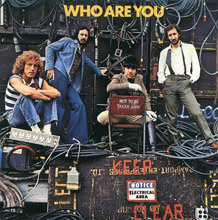 Who Are You is the eighth studio album by English rock band The Who, released on 18 August 1978 through Polydor Records in the United Kingdom and MCA Records in the United States. It peaked at number 2 on the US charts and number 6 on the UK charts. 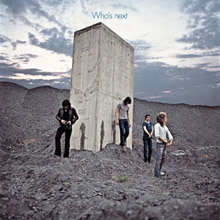 It is The Who's last album with Keith Moon as the drummer; Moon died twenty days after the release of this album. 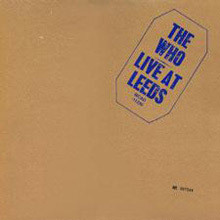 Rushed out in 1970 as a way to bide time as the Who toiled away on their follow-up to Tommy, Live at Leeds wasn't intended to be the definitive Who live album, and many collectors maintain that the band had better shows available on bootlegs. But those shows weren't easily available whereas Live at Leeds was, and even if this show may not have been the absolute best, it's so damn close to it that it would be impossible for anybody but aficionados to argue. Here, the Who sound vicious -- as heavy as Led Zeppelin but twice as volatile -- as they careen through early classics with the confidence of a band that finally achieved acclaim but had yet to become preoccupied with making art. In that regard, this recording -- in its many different forms -- may have been perfectly timed in terms of capturing the band at a pivotal moment in its history. There is certainly no better record of how this band was a volcano of violence on-stage, teetering on the edge of chaos but never blowing apart. This was most true on the original LP, which was a trim six tracks, three of them covers ("Young Man Blues," "Summertime Blues," "Shakin' All Over") and three originals from the mid-'60s, two of those ("Substitute," "My Generation") vintage parts of their repertory and only "Magic Bus" representing anything resembling a recent original, with none bearing a trace of its mod roots. This was pure, distilled power, all the better for its brevity; throughout the '70s the album was seen as one of the gold standards in live rock &a roll, and certainly it had a fury that no proper Who studio album achieved. It was also notable as one of the earliest legitimate albums to implicitly acknowledge -- and go head to head with -- the existence of bootleg LPs. Indeed, its very existence owed something to the efforts of Pete Townshend and company to stymie the bootleggers.